PRINCETON, New Jersey, April 30, 2013 (ENS) – Six months after Superstorm Sandy struck the U.S. Atlantic coast, data from the eight hardest hit states shows that 11 billion gallons of untreated and partially treated sewage flowed into waterways and city streets, reports Climate Central, an independent organization of scientists and journalists based in Princeton. As record storm-surge flooding overwhelmed the region’s sewage treatment facilities, most of those 11 billion gallons of sewage flowed into the waters of New York City and northern New Jersey during and after the storm. “To put that in perspective, 11 billion gallons is equal to New York’s Central Park stacked 41 feet high with sewage, or more than 50 times the BP Deepwater Horizon oil spill,” Dr. Alison Kenward, senior scientist and research manager at Climate Central, told reporters on a conference call today. Climate change is making sewage treatment plants more vulnerable to major failures and overflows due to rising seas, more intense coastal storms, and increasingly heavy precipitation events, said Dr. Ben Strauss, chief operating officer and director of the program on sea level rise at Climate Central. “It’s unappreciated, but every single coastal flood we have today anywhere in the United States is worse because of climate change causing sea level rise,” Strauss told reporters. Climate Central’s analysis of sewage-spill data provided by state agencies and treatment plant operators shows that one third of the overflow, 3.45 billion gallons, was untreated raw sewage. The remainder, 7.45 billion gallons, was partially treated, so it received some level of filtration and possibly chlorination. The study found that 94 percent of the spilled sewage, over 10 billion gallons, was the result of some form of damage caused by coastal flooding. In some cases, Sandy’s storm surge flooded treatment plants and pumping stations, while in other cases a combination of power outages and flood conditions forced the closure of facilities or caused major diversions of sewage into receiving waters. Eighteen of the 20 largest spills contaminated New York and New Jersey waters, as did the four individual sewage overflows of more than one billion gallons each; two each from New York and New Jersey. New York City reported six sewage spills larger than 100 million gallons, and 28 larger than one million gallons. Long Island faced large spills from the Bay Park facility. When the plant was knocked out of service for 44 hours, roughly 100 million gallons of untreated sewage overflowed into Long Island’s Hewlett Bay. Another 2.2 billion gallons of partially treated sewage flowed through the plant during the 44 days it took to fully restore operations. In Westchester County, 49 million gallons of untreated sewage flowed from the Yonkers treatment plant during 14 hours at the peak of the storm. Another 1.2 billion gallons of partially treated sewage flowed from the plant in the ensuing four weeks. In New Jersey, the Passaic Valley Sewerage Commission in Newark reported the largest spill of all. 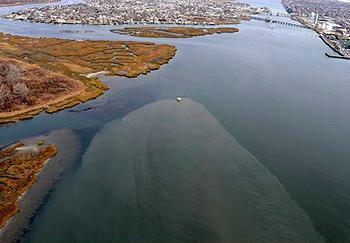 During the week after the storm, 840 million gallons of untreated sewage flowed into Newark Bay. It took another two weeks to get most of the treatment up and running, and during that time another three billion gallons of partially treated sewage overflowed. The exception to storm-surge related sewage discharges was in Washington DC, where rainfall was the cause of the overflows. In the nation’s capital, Sandy produced 5.1 inches of rain in 24 hours, leading to the sixth-largest Sandy-related sewage overflow at 475 million gallons of untreated sewage and contaminated runoff. That was the only rain-related sewage spill in the top 30 overflows. Overall, heavy rainfall caused a reported 776 million gallons of sewage spills to waters in Mid-Atlantic States. In addition to sewage overflows, Sandy severely damaged numerous treatment plants and pumping stations. Damage to a number of treatment plants kept largely untreated sewage flowing into local waterways for weeks, and in some cases, even months after the storm. 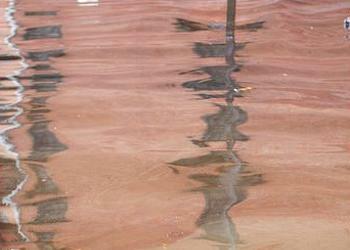 The last known Sandy-related sewage overflow took place in January 2013. Climate Central is unable to estimate the total costs of repairing sewage systems impacted by Sandy, but according to state authorities the cost of repairing Sandy’s damage to sewage treatment plants in New York is nearly $2 billion. The New Jersey Department of Environmental Protection plans to allocate nearly $1 billion for recovery and repair of facilities, and another $1.7 billion for building resilience into the system.